infoQuant's oneClickCGH® is a novel platform-independent array Copy Number analysis software that provides straightforward yet comprehensive detection and reporting of copy number changes. This is conceptually an end-to-end solution for array data interpretation in a clinical setting bringing powerful analytics and a wealth of biological annotations straight to your computer. infoQuant has put years of experience in aCGH and SNP data processing in clinical laboratories behind oneClickCGH software in order to create a simple, but efficient tool that helps report DNA anomalies. 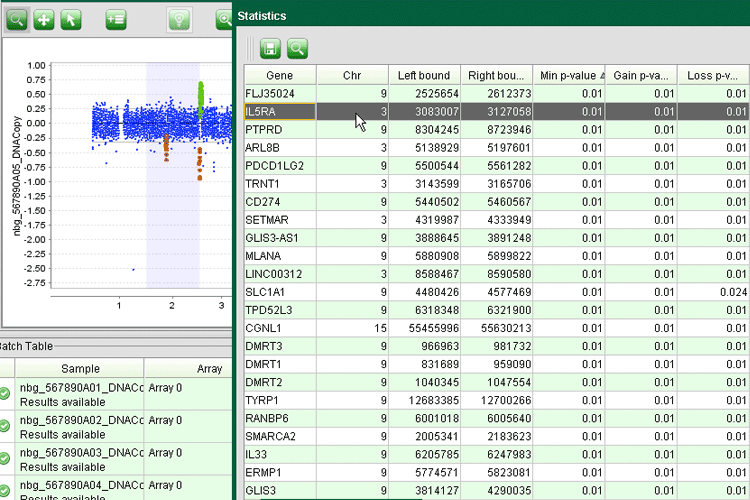 oneClickCGH stands out among other commercial DNA copy number analysis software packages due to its straightforward user interface and comprehensive reporting features. In a few clicks users can go through multiple stages of advanced data processing and start assisted interpretation of automatically detected gains, losses and LOH regions. Detected copy number variations can be added to report document and manually edited, if needed. User can add sample or patient information, region annotation, interpretation comments and other kinds of useful records to the report. And finally, analysis results can be saved as a comprehensive graphics-rich Word document, PDF file or a compact Excel table. oneClickCGH is compatible with data formats used by all major array CGH and SNP platforms: PerkinElmer, Agilent, Affymetrix, Roche-Nimblegen, Illumina, BlueGnome and more. oneClickCGH is the only software for designed for clinical use and supporting both BAC arrays and high-resolution oligo platforms. Our workflow integrates LOH detection with Copy Number analysis for the users of SNP arrays. Utilizing allele-specific measurements oneClickCGH provides reliable and meaningful LOH calls suitable for cancer studies with SNP platforms. State-of-the-art interface gives you instant interactive access to probe-level plots, report table, Quality Control info and various annotation tracks. 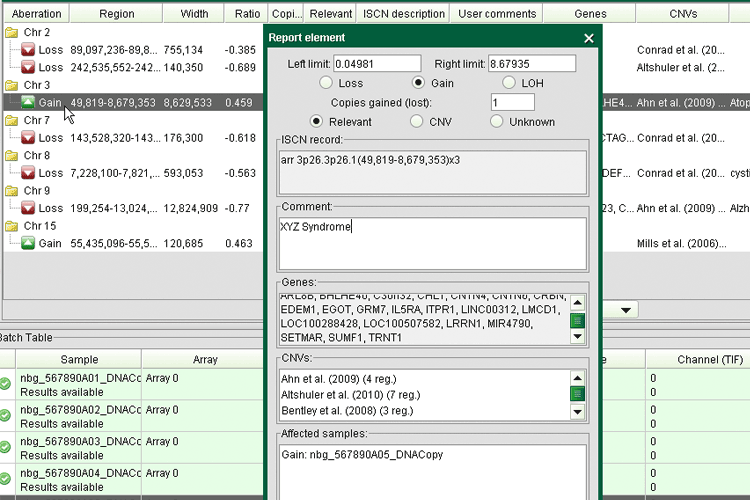 Detected aberrations can be edited and reviewed in a fully interactive manner, which makes DNA Copy Number informatics a simple and intuitive process. 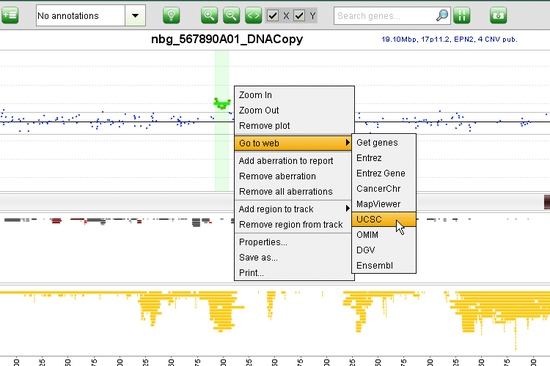 oneClickCGH also interfaces with publicly available knowledge databases like Entrez, Database of Genomic Variants, UCSC Genome Browser, DECIPHER and other for efficient interpretation of the results. 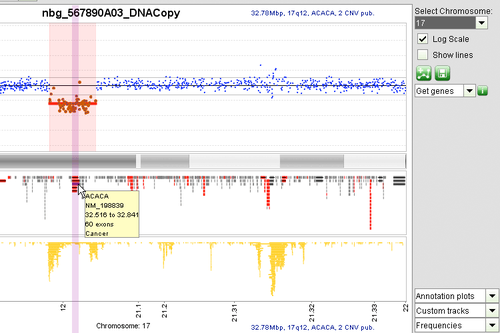 Gene annotations are integrated directly into our data visualization tools to facilitate user-friendly reference to known genes, their associations with various disorders and gene ontology terms. We have also integrated known Copy Number Variant (CNV) tracks from public sources into oneClickCGH. Intelligent gene name search helps you quickly find regions of interest on the ratio plot. This ensures that our users can make insightful inferences regarding clinical relevance of detected anomalies with minimum effort. And finally, integration of custom in-house CNV tracks can make aberration reporting even more productive turning oneClickCGH into an ultimate Cytogenetic software package. oneClickCGH employs modern methods of statistical analysis throughout its workflow: from data normalization to analysis of significantly affected genes. Our method of Robust Binary Segmentation developed together with leading Cytogenetic laboratories delivers reliable and consistent detection of chromosomal anomalies. Analysis of gene significance delivers a prioritized list of genes affected by detected aberrations and visualizes high-priority regions on the ratio plot. results generated through oneClickCGH or CGH Fusion with their colleagues within or outside their institution. 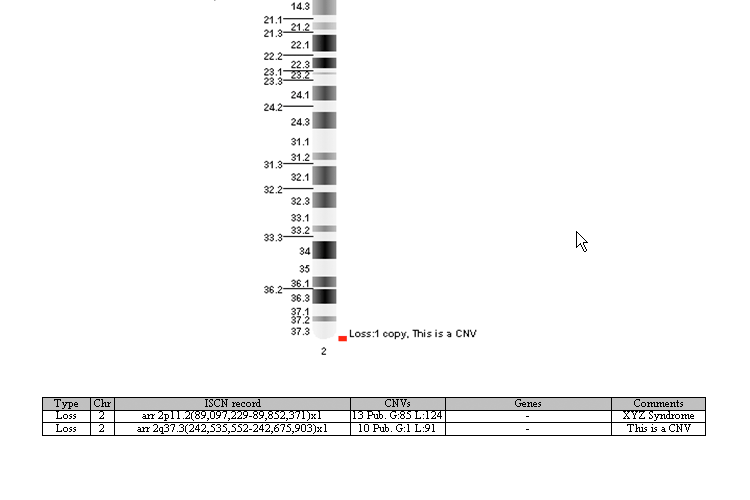 oneClickCGH Viewer software, while not as powerful as oneClickCGH, provides a graphics-rich and informative display of array data and detected anomalies saved with the full version of our analytical software. As a result, our users can communicate with their peers freely and efficiently.